It'll be hard to make it for the launch, being 3,488.62 miles away. 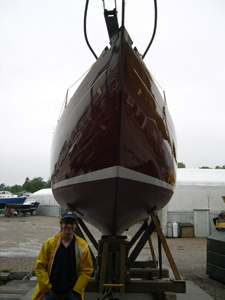 So, I guess this blogpost is the post-Internet way to let Stuart and the Concordia team know how much our family appreciates their fine work and care for our old classic Houtenboot (Wooden Boat)! I wish to reiterate how thrilled both Nat and I are to have our boat with you (Stuart) and your team at Concordia. It is a pleasure working with you. Also Marc and Joe could not have been more professional and skilled. When it came to launching and rigging our new boat, they got right on the job and handled her with loving care. The bow chocks look awesome! I very much appreciate your initiative and efforts to get everything done. Your attention and customer service are what makes Concordia a great yard. From the moment I got back, everyone at Concordia treated me like long-lost family. After a quick call to Carol, Stuart got right back to me. He discussed my options, made some recommendations, and worked it out so we could get the boat in over the weekend. On Monday, Steve inspected the engine, and in just a few hours had contacted the factory folks at Pathfinder, diagnosed a timing problem, and had it running perfectly - all before the end of the day. He even fabricated a special tool I had forgotten to leave out for him. I just wanted you to know that the entire experience was first class, even Ryan at the dock helping me in. And I just can't say enough good things about Steve. Cody Harple standing next to Taliesin.